The school program endeavours to develop the following safety habits. Please reinforce these at home. Drivers must observe the parking signs outside the school. In particular they should note the designated ‘kiss and go’ spaces in High Street. Internal and external supervision is undertaken by teachers to cover recesses, and fifteen minutes before and after school. Students are encouraged to seek duty teachers if a playground problem or accident occurs. If students arrive prior to 15 minutes before school, they should be booked into Before School Care. It is a requirement that your child maintains full school attendance for prescribed times unless she/he is ill. The First Aid Room is only for immediate, short term care of students. A note, email or notification to the class teacher or the office upon return from illness providing reason for absence is a legal requirement. If your child is ill due to one of the following: mumps, chicken pox or measles, please notify the school immediately. As part of the Department of Education and Training (DET) regulations and initiative “It’s Not Ok to be Away”, schools are required to inform families that same day if their child is absent (unexplained) from school. Families are required to inform the school when their child is absent as soon as possible. 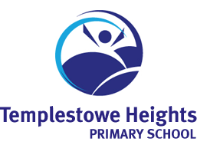 As part of our fulfilment of this requirement Templestowe Heights Primary School has implemented Compass absence notifications. The school will notify parents and guardians of their child’s ‘unexplained absences’ by communication this through the Compass school portal. Once your child commences at the school parents and guardians will receive an email link from Compass with information on how to set up their password and download the app. Students arriving late to school must be signed in at the school office and obtain a late pass before proceeding to their classroom. Parents/guardians wishing to collect students during school hours must first obtain an Early Leavers Pass from the school office. This pass must be handed to class teachers when collecting your children. Only authorised persons over the age of 18 are permitted to sign students out during school hours. A student information record is kept on file for each child. This enables the school to contact parents or the emergency contact in case of an accident or illness. Parents are requested to advise the school of any change of address or telephone numbers. Please notify the school of any relevant information regarding custody and access rights which would affect your child’s security. Such issues will be handled in confidence. We have a well equipped first aid room. Most staff have been trained in first aid and are available for assistance. Teachers on yard duty are equipped with basic first aid supplies.